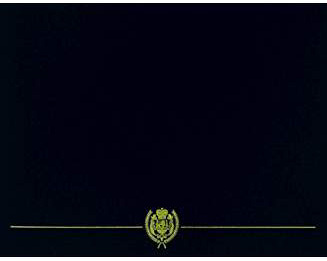 The Primary Leadership Development Ribbon was established on April 10, 1981, by Secretary of the Army John O. Marsh, Jr. The Primary Leadership Development Ribbon has been in effect since August 1, 1981. For budgetary reasons the PLDC was not made retroactive. However, prior service NCO leadership and advancement personnel are permitted to wear the PLDC ribbon. The Primary Leadership Development Ribbon is awarded to all enlisted members of the Army to include the Reserve Components (Army National Guard and Army Reserve), for successful completion of designated Primary Leadership development courses. The Primary Leadership Development Ribbon is worn after the Armed Forces Reserve Medal and before the Army Service Ribbon. This ribbon may not be worn on the Navy or Coast Guard uniforms. The numerals "2" "3" and "4" are worn on the ribbon to indicate the highest level of training successfully completed. Army members who complete primary level NCO training (Primary NCO Course, Combat Army Course, and Primary Leadership Development Course) will wear the ribbon without a numeral, and those who complete higher levels will wear the appropriate numeral. The numeral "2" denotes the basic level (Basic NCO Course, Combat Arms; Basic Technical Courses, and Basic NCO Course). The numeral "3" denotes the advanced level (Advanced NCO Courses). The numeral "4" denotes senior level courses. The numeral "5" is obsolete and was formerly used to denoted completion of the U.S. Army Sergeants-Major Academy. 1. Description: The ribbon is 1 3/8 inches in width. It is composed of the following vertical stripes: 3/16 inch Green 67129, 1/8 inch Yellow 67108, 3/16 inch Green, 1/16 inch Yellow; 1/4 inch Flag Blue 67124, 1/16 inch Yellow, 3/16 inch Green, 1/8 inch Yellow, and 3/16 inch Green. 2. Components: Ribbon. MIL-D-11589/283. (There is no medal for this ribbon). 3. Criteria: a. 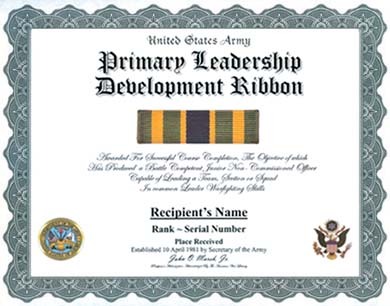 The Primary Leadership Development Ribbon is awarded to members of the United States Army, Army National Guard, and Army Reserve for successful completion of designated Noncommissioned Officer professional development courses. b. A numeral is affixed to the ribbon to indicate completion of specific levels of subsequent courses. Primary level course is indicated by the basic ribbon; basic level course with the number 2; advanced level course with number 3; and senior level course (Sergeants Major Academy) with number 4.
c. Specific criteria for award is contained in AR 600-8-22. 4. Background: a. The Primary Leadership Development Ribbon was established by the Secretary of the Army on April 10, 1981.
b. The colors of the ribbon represent the colors of the chevrons worn by the non-commissioned officer and are on each side of a blue field representing support to the United States.